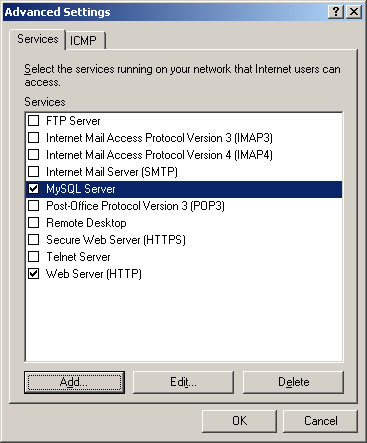 To access MySQL Server over a local Windows network you will need to open up the port that MySQL is using and also grant privileges for the user that will access the database server. Under the network connection settings select Local Area Connection and then Settings. Select Add a new service. Name it something sensible like MySQL Server. 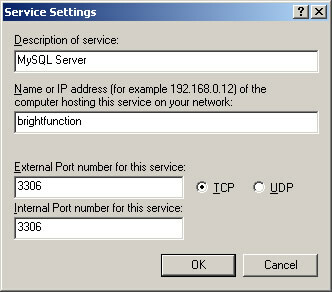 Enter the IP address or computer name of the computer running MySQL. Specify the port number 3306 for both external and internal port numbers and select TCP. The new service should now be listed under services and selected. Now choose OK to exit each window that appears to save the changes. With the service created you should now be able to connect to the database from another machine on the network. With these changes you should now be ready to go and be able to access the database server across a Windows local network. This entry was posted in Programming and tagged MySQL, Windows. Bookmark the permalink. Post a comment or leave a trackback: Trackback URL. second, I open my Mysql Workbench then goto Users and Privileges > select root user > Login Tab > Limit Connectivity to Hosts Maching > %. then Done from Another network desktop computer via Lan, and I can now use my Server as a Storage Data server. Thanks a lot for your very useful post. You’re welcome Mahadi. I’m pleased it helped! Glad you got there! I think the settings are quite similar under Windows 7. I have windows 8 and when I open firework don’t find local are network and can’t follow your guide can you helpme please? I don’t have Windows 8 anymore but I think you can use the Windows 10 approach which is to go to ‘Windows Firewall’, ‘Advanced Settings’ and then create an ‘Inbound Rule’ for port 3306. I have the same probelm with Mysql , i am using Unicenta opos software with Win7 . I can not access from the other PC? Did you replace ‘user’ with your username and ‘host’ with the computer name? If you post the statement you used I can check for any problems. To connect to PC1 from PC2 you would need the local IP address or computer name of PC1 which you would then use as the ‘server host’ for the connection from PC2. I sent you an email with a bit more information so I hope that helped. Hi nick, could you please send me also the email u sent to Nisha. I want to setup a mysql server that can be used in lan connected computers as well. Thanks in advance. Hi vtsoft. I’ve emailed those details I sent Nisha. The details in the post should cover the basics though. For Windows 7 use the Start Menu and search for ‘Allow a program through Windows Firewall’. From there the approach is quite similar. After doing those things, what should I do so that my program(in PC 2) can access the database on other computers(PC 1)?? It sounds like you have a similar query to Nisha above. Instead of using localhost as the host you specify the computer name or IP address of the PC you want to access. I’ve sent you that email Zai.